What is the role of the architect? They make buildings, right? Wrong. 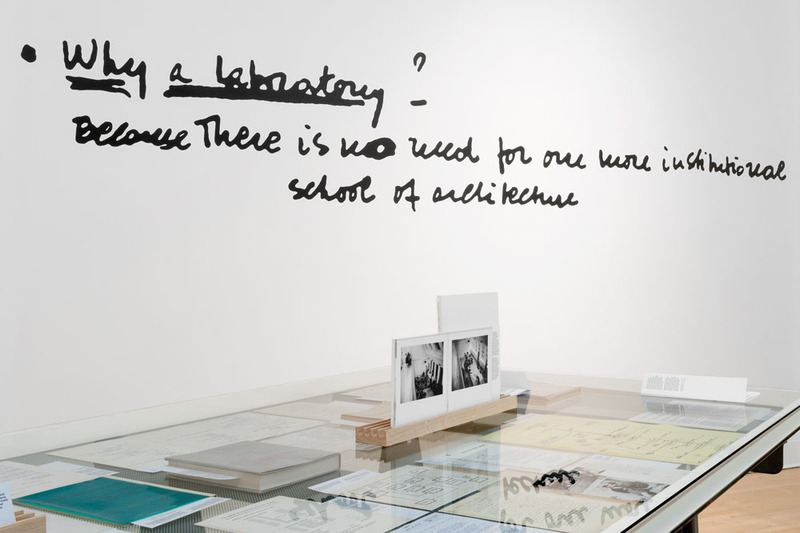 Joy Knoblauch went to see the exhibition The Other Architect, now on show at the CCA, and discovered what it takes to become an “other architect”. In 1940, the United States Public Health Service called on architects to combat the hospital shortage by raising funds and organizing projects in their towns. A similar call to the expanded role of leadership was made by the United States National Institute of Mental Health, when architects were asked envision a new type of community mental health centre. Such collaborations of architects and governments for the ‘public good’ have a long history and draw on more than their skills at making buildings. Previously the Canadian Centre for Architecture shows such as Architecture in Uniform, Imperfect Health, and Sorry, Out of Gas, have taken on the public role of the architect. The Other Architect, the exhibition now on show, amply demonstrates the utility of the architect’s ability to observe their environment and to craft representations that envision an alternative. With an awareness of the world beyond ‘architecture’, OM Ungers mapped the communes, Architecture Machine Group critically reflected on cybernetics, AMO considered the implications of the European Union, and Forensic Architecture engaged with humanitarian geopolitical question. Curated by Giovanna Borasi, The Other Architect presents the radically normal work of 23 insightful and important groups of architects, including Art Net, Cedric Price’s Lightweight Enclosures Unit, CIRCO, Architectural Detective Agency, Anyone Corporation, and Institute for Architecture and Urban Studies (IAUS). Ranging from the 1960s to the present, the show demonstrates that these architects are, and have been for a long time, engaged in the politics of the places they call home, whether it’s local or global. These practices were radical — having the potential to change the political, social and aesthetic status quo — as well as normal — in that grant proposals and television programmes are not unusual for fields like planning, public relations, administration, or art. The Other Architect showcases architectural media beyond the model. The visitor literally passes by a giant model made by OMA at the time that they launched AMO. The relationship between these two mirror organizations is quite unique, and not incompatible with the much bemoaned culture of the starchitect. But their relationship and the presentation of an organizational diagram shows the importance of working within broader institutional linkages to places like Harvard University in order to perform such apparently autonomous work. Funding, support and prestige certainly help with the production of work that has ‘the public’ as its client, and universities, governments and corporations have long funded such work for their own aims. Working within such a context is normal, but the myth of autonomy is an expensive one. The organization charts and funding requests for the IAUS show the amount of time spent in fundraising for work that can have the illusion of being without a client. 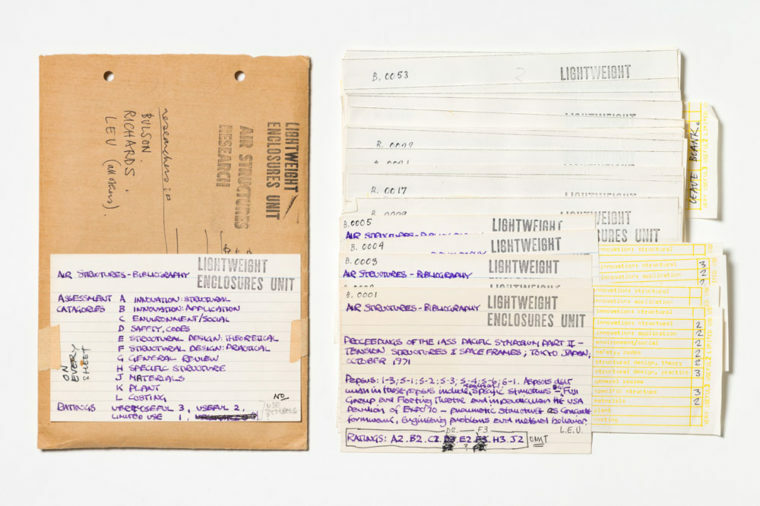 The complex exercise of architectural agency, and to a lesser extent patronage, is demonstrated by the wide range of documents chosen for the show. 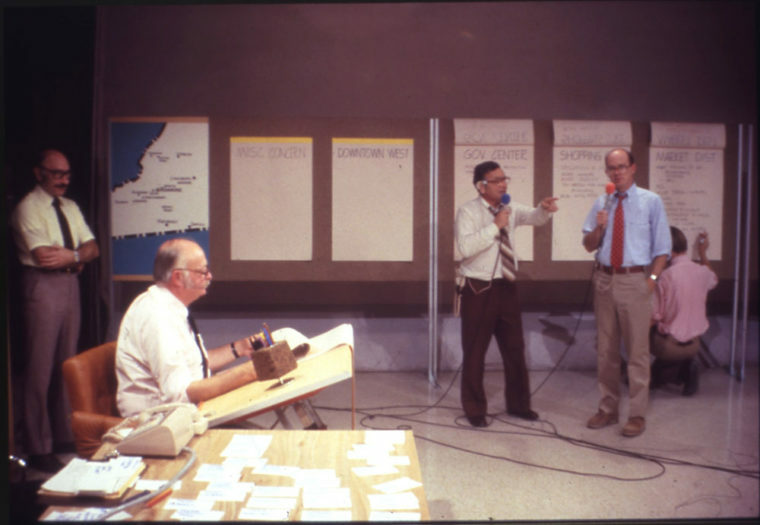 Each group is given a table, with a vertical display of a mission statement, first grant application, or letter declaring intent accompanied by budgets, organization diagrams, to show how the group created their ‘other’ work of video, newsletters, cartoons, diagrams, and other tools of public relations. Some of the work is rhetorical. As the urbanists of Corridart proclaimed “put contradictions where we can see them”. 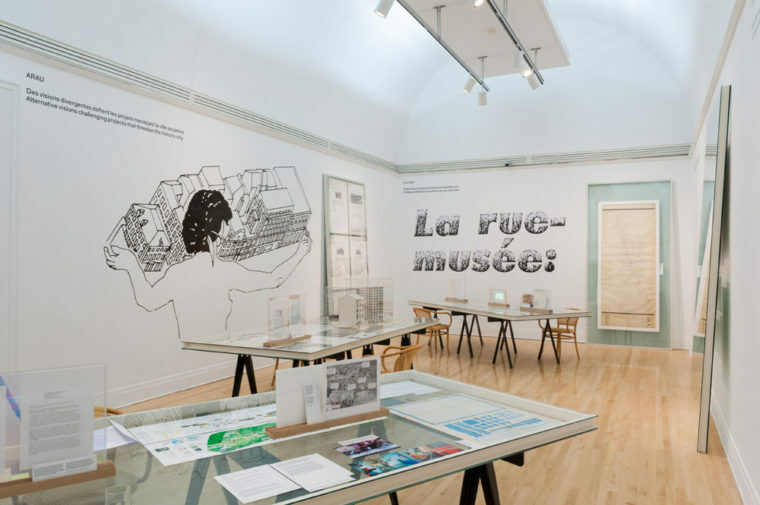 That call applies equally to city governments, transnational governments, and architects themselves in the case of Charles Moore’s Design-A-Thon in 1976, where models could be manipulated by the public and where architects worked on display literally to demystify the design process. Playing with new media, they also broadcast on television programme with a phone number for the public to call in. Such efforts are between education, practice and research, and constitute a public engagement or outreach. Spending time with The Other Architect, one has to wonder whether this really is the edge of the field, not only because many of these architects are known for polemical and or politically engaged work, what Rem Koolhaas calls ‘architectural thinking’ in the show. This engaged and thoughtful work may well be the very thing that gets an architect known, the centre of the field. As Beatriz Colomina (Princeton University School of Architecture) argues, an architect endures because they have a good book or journal that can circulate and make an impact in a way that an image of a building alone rarely does. The ties between the architecture and its public contribute to a lasting impression. The work in this show may well not be ‘other’ at all, but instead such engaged and intelligent work may be the means to a relevant and responsible practice of architecture. And lastly, the show makes clear that 2015 is not the only time when the profession was faced with great social and technological change. In his introduction to the 1960 Stocktaking series, architecture critic Reyner Banham declared that the profession of architecture tended to draw back in the face of great changes, to “scribe a line around the status quo, about as far out as it can reach without straining, and say ‘Everything beyond this line is Not Architecture, and no real concern of ours’”. He rightfully observed that this entrenchment never really holds, that the great architects will always attend to what is around them and use their “all-devouring artistic conscience” to “invade neighboring fields” and break new ground. The Other Architect provides a rich history and a model for future practice, for those architects who want to exercise their agency using the open, creative, and critical mind of an architect. Reyner Banham, “1960 Stocktaking [of the Impact of Traditions and Technology on Architecture Today].” Architectural Review 127 (1960): 93–100. Joy Knoblauch, PhD is an Assistant Professor of Architecture at the University of Michigan in Ann Arbor and a Fulbright Scholar at the Institute for Health and Social Policy at McGill University. Her work focuses on architecture as it mediates between government, social science, medical science, and the public.